Quick Study: Natalia Solzhenitsyn, the widow of writer Alexander Solzhenitsyn, is president of the Solzhenitsyn Foundation and editor of a 30-volume edition of her husband’s collected works. The Natalia Solzhenitsyn File: Natalia Solzhenitsyn heads up the Solzhenitsyn Foundation, an organization established in 1974, initially to provide financial assistance to people who were persecuted in the Soviet Union; assisting victims of political repression remains a part of the Foundation’s activity. 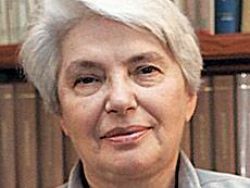 Natalia Solzhenitsyn’s literary work includes editing her late husband’s collected works and serving on the jury of the Solzhenitsyn Prize, awarded annually to recognize writers living in Russia and writing in Russian. Psssst………: Natalia Solzhenitsyn told the newspaper Novye izvestiia in 2008 that she read One Day in the Life of Ivan Denisovich the day after it came out in the journal Novyi mir in November 1962, immediately reading it twice: once in the evening then again that night… The Solzhenitsyn Foundation was established using world royalties from sales of The Gulag Archipelago. Natalia Solzhenitsyn’s Places: Moscow: Born in Moscow, studied mathematics at Moscow State University. Cavendish, Vermont: residence during exile.